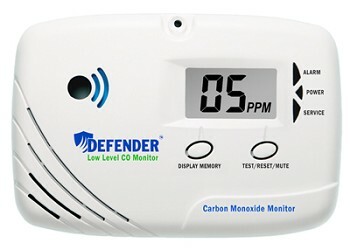 The Defender LL6070 Sealed Lithium Battery Powered low level carbon monoxide monitor continuously displays CO levels detected of 5 PPM or more. Visual alert signals are activated when 10 PPM of CO is detected, and visual and audible alarm signals at 15 PPM. 10 PPM 10 mins., reset suspends for 24 hrs. 25 PPM 30 mins, mute silences for 5 mins. 50 PPM 15 mins, mute silences for 5 mins.